A group of paraplegic Congolese musicians team up with Roger, a street kid who plays his own homemade one-stringed instrument. Can this unlikely band, known as Staff Benda Bilili, overcome the obstacles and setbacks in their path to record an album, tour Europe, and provide for themselves and their families? 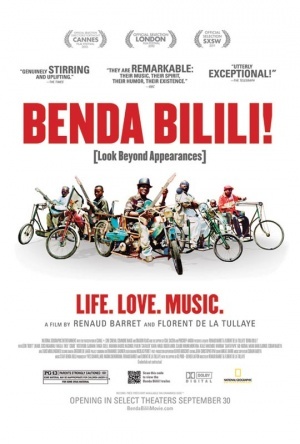 That's certainly the kind of story that would make for a gripping documentary, and to some extent that's what we have in BENDA BILILI!, a film that follows these musicians over the course of five years. I say to some extent because co-directors Renaud Barret and Florent de La Tullaye become so involved with their subjects that they alter events in a very direct manner. They provide money for the group to record, and are responsible for introducing Roger to the older members of the band. I don't believe any documentary can be 100% unbiased and dispassionate, but I think many viewers will feel as if BENDA BILILI! crosses a line that shouldn't be crossed in a documentary film. Don't get me wrong, I can understand why the filmmakers do what they do, but it can't help but undermine the integrity of their film. Even with the filmmakers on their side, there are plenty of bumps along the road to success. Just day to day life in the Democratic Republic of the Congo is no picnic, even for able bodied citizens. Perhaps the film's most dramatic moment, though, is when we find out what happens to the shelter many of the members live at while they're away at their very first recording session. It's in moments like these when real life proves far more dramatic than anything that can be orchestrated that BENDA BILILI! is at its most fascinating. So what about the music? Are these guys the real deal? I'm not that well versed in “world music”, but I know playing and writing ability when I hear it, and these guys have both. The band mines their personal experiences for lyrical subject matter, singing songs about sleeping on cardboard, being made fun of for their disabilities, and urging mothers to get their children vaccinated (the disabled members of the group all got that way from polio). The four older paraplegics are capable musicians and singers, and their vocal harmonies are a real strength of the group. For me, though, the real star is Roger; it's hard not to be impressed with the ingenuity behind his home-made instrument, and he eventually gets good enough on it to solo like a rock god.